Venice, Italy - the magnificent and almost unimaginable city built upon water. ...to simply enjoy a romantic getaway in one of the most beautiful places on Earth! All images on this page are by the author, sockii, unless provided by Amazon. 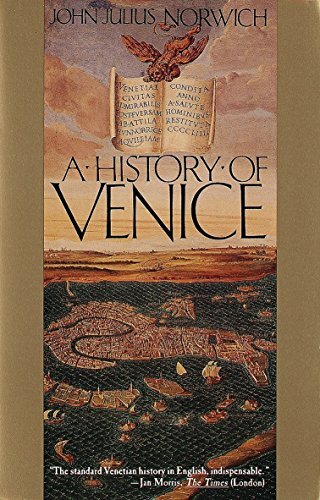 To share all of Venice's lengthy history and reasons to visit would take many volumes of written text (and indeed, countless books have been written on the subject.) I have personally visited Venice four times over the past now 11 years, each trip ranging from a week to over two weeks (I was actually "stranded" in Venice during Hurricane Sandy in 2012...not much of a hardship!) As such I have a fair amount of experience navigating through the city, enjoying its sights and attractions, and never failing to find new unexpected delights and treasures to make each trip a special experience. This page, and my goal here, is to share some of my recommendations and advice on how to make the most of your own Venetian holiday. I'll share some basic facts on top attractions, and link you to my more detailed articles on specific topics such as transportation, lodging and dining, and the other islands in the Venetian lagoon you should be sure to explore as well, should you have the time. Have you been to Venice, Italy before? Venice is a city in Northeastern Italy, the capital of the Veneto region. It is not, in fact, just a single island but actually a collection of 118 islands linked by bridges and canals. These islands are located in the shallow waters of the Venetian lagoon, originally settled by refugees of Roman cities fleeing the mainland and Germanic and Hun invasions. Venice's isolated location led to its growing autonomy from the mainland—and importance as a developing trade center between the East and the West. 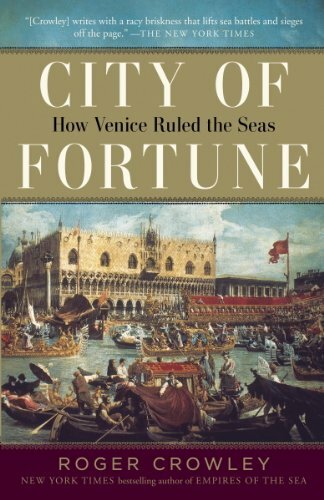 In fact by the late 13th century, Venice was the most prosperous city in all of Europe! Venice had developed its own government system not too dissimilar from the ancient Romans, with an elected "Doge" and an assembly of nobles acting much like a senate. Venice also operated with as much freedom as they could manage from the rule of the Papacy; you can see a great deal of Arabic influence in its architecture, and the first Jewish "ghetto" in the world can be found in Venice. 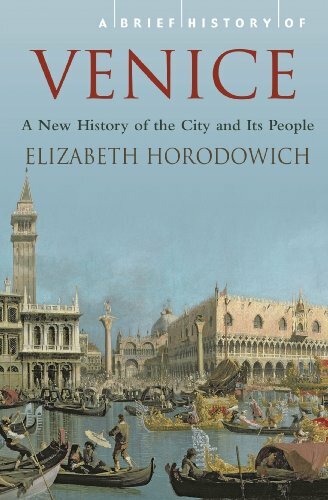 Venice's power began to decline in the 15th century, after the opening of new trade routes destroyed their "monopoly". The plague also devastated the city's population, not once but twice. In 1797 the Venetian Republic was conquered by Napoleon, ending centuries of independent rule. In 1866 it became part of the Kingdom of Italy. The city fortunately, largely escaped damage during World War II, but today many worry that over-tourism may lead to irreparable damage to the city's cultural and historical treasures. The #EnjoyRespectVenezia campaign has been launched to encourage sustainable tourism while respecting the city and ensuring it can be appreciated for many generations to come. Don't plan your trip to Venice without the best tourist guides in hand! Tour books in this modern day and age? Absolutely! While there may be a wealth of information online (including my own travel guides!) I still strongly recommend investing in a few good tour books before you leave for Venice. You might not always have access to your smart phones or the internet while traveling about, and these can help you plan things you want to see and do in advance as well as provide suggested itineraries, floor plans for museums and churches, walking maps and much more. You might also find a good map useful as well, and in my experience none is better than "Streetwise Venice". This sturdy, laminated map shows you all the detail of Venice's often confusing streets, canals and alleys, and also includes a map of the vaporetto waterbus system. Admittedly on my most recent trip to Venice, in 2018, I used my smart phone and Google maps to get around more than a paper map. But I would always recommend keeping a physical map on hand even if you navigate by phone like I do. You could run out of battery power, end up in a "dead zone" with no cell service, or be caught in a nasty rain storm! So don't always count on technology to get you around—and Venice can be quite confusing for the first time and repeat visitors alike until you get your bearings. There are numerous ways to explore Venice by foot or by water. It is actually quite a walkable city, with numerous bridges crossing the canals, narrow walkways along the canals and streets or "calles" in between the waterways. In fact, you'd better get used to walking because there are no cars to be found on the lagoon islands of Venice, except on Lido island! Although signage can sometimes be confusing and it is easy to lose your sense of direction, there is only so far you can go in Venice before hitting a major waterway or attraction, so it is simple to get back on track quickly enough. A gondola ride is of course incredibly romantic and a traditional way to get around Venice. However, today it is an extremely expensive option - think 80 Euros or more - and primarily meant only for tourists. Venice is connected to the mainland of Italy via the Santa Lucia train station, as well as buses that stop at Piazzale Roma. 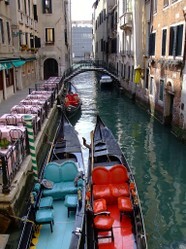 Lastly there are the Venetian water taxis for those in a rush - and willing to spend some serious cash. The water taxis are strictly regulated in Venice and you can secure a booking either by telephone or via the water taxi website. It certainly is an elegant way to travel but be prepared to pay a hefty price for the luxury (a ride to or from the airport is about 120 Euros.) However, if you have a very early morning flight or other difficult connection to make, the water taxi can come very much in handy. Make no mistake - Venice is not a cheap city to visit! Food, hotels, and transportation all tends to run higher in price than you'll find elsewhere throughout Italy. You've probably heard that "Venice is sinking"—and seen pictures of the city seemingly half under water. Well, it's not so much sinking as suffering from seasonal high tides known as the "Acqua Alta". Some say it is due to global warming and atmospheric changes; others say it is the oil refineries built not far away which are to blame. Whatever the cause, Acqua Alta can occur at any time but is typically most prevalent from late September to April, and particularly in the months of November, December, and October, in that order. Bring your boots...wet feet during Acqua Alta is no fun! I have been in Venice during Acqua Alta and it can definitely put a damper on your vacation, if you are not prepared for the experience! Elevated walkways will help get you around some of the most commonly flooded, lowest-level parts of the city, but you will have to be prepared to get your feet wet to some degree. 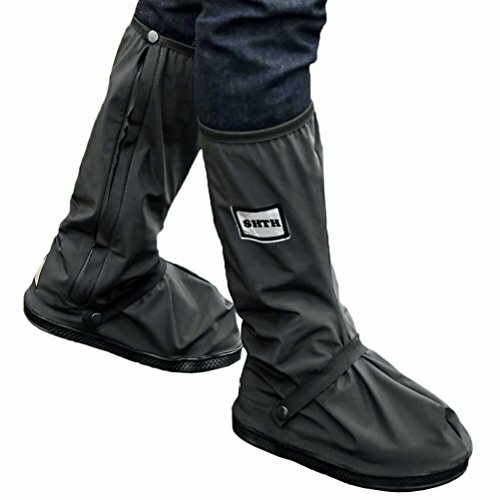 I recommend packing a pair of lightweight collapsible boots or shoe covers for your trip, "just in case" (and for sure if traveling during the most common months for Acqua Alta.) Some extra plastic ziplock bags or vacuum storage/packing bags would be wise as well, just in case you might have to carry luggage around in flooded areas and have items to protect from moisture. These shoe-covers are a great choice, and the ones I bought myself before my most recent trip to Venice. They come in a variety of sizes and pack down flat, making them easy to pack. And they're super light-weight, too! 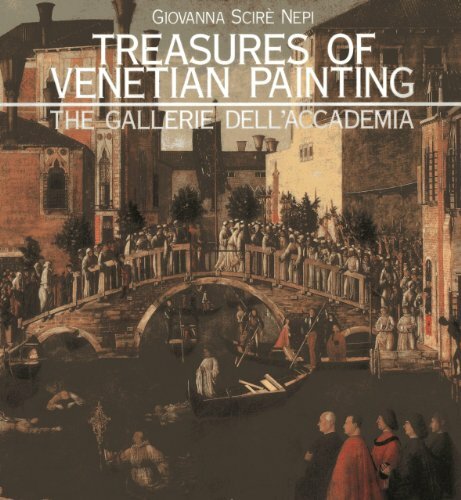 Many artists have come to Venice through the centuries, enchanted by her art and beauty. 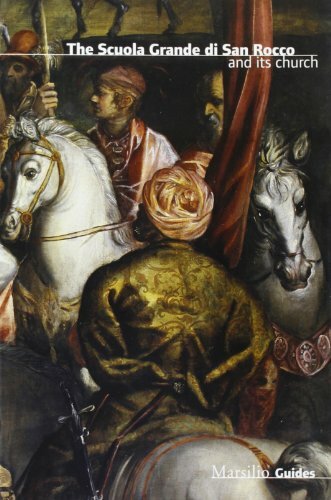 Three artists who in many ways defined art in Renaissance Venice were Jacopo Tintoretto, Paolo Veronese and perhaps most notably Titian. Their work is varied yet some called them great "Rivals" at the time, competing for the best commissions in Venice and inspiring/being inspired by the others. One notable aspect of much of Venetian artwork of the Renaissance is its immense size. While other Italian cities used fresco painting to decorate ceilings and walls in great palaces and churches, the moisture of the air in Venice made that approach less desirable. Instead, Venice's great shipping industry provided a better alternative: canvas, as used for sailing ships. Magnificent, huge canvas paintings can still be found all around Venice such as in The Scuola Grande di San Rocco, perhaps the greatest showcase of Tintoretto's work in the world and an absolute must-visit while in Venice. Visit the great halls that housed Venice's great government, as well as the house of The Doge, Venice's leader. You'll see incredible artwork by Titian, Tintoretto, Veronese and many more in its splendid halls and rooms along with learning about Venice's history, government and military. Be sure to get tickets to the "Secret Itineraries" Tour, to get a full behind-the-scenes look at the palace and the rooms not visited by most. After visiting the Doge's Palace, spend some time at the Museo Correr checking out the historical artifacts and armor. There is also sculpture by Canova and artwork by the Bellini family and more worth seeing. Without question the finest art museum in Venice. 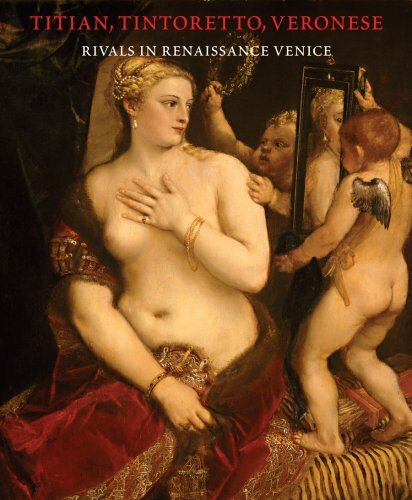 Home to masterworks by Titian, Tintoretto, Veronese, Canaletto, Tiepolo and many more Venetian Renaissance artists. It's a definite must-visit for art lovers. Lovers of modern art should be sure to visit the Peggy Guggenheim Collection, located in her former home, Palazzo Venier dei Leoni on the Grand Canal. The museum contains one of the most important collections of early 20th Century Modern Art with works by De Chirico, Dali, Miro, Picasso, Magritte and Klee to name a few. This museum traces the history of glass-making, the art for which the island of Murano (where the museum is located) is famous. Learn about the history of lace making and artistry on the island of Burano in the Venetian lagoon. This 18th century palace on the Grand Canal is an important example of baroque architecture and houses works my important artists of the time, including Francesco Guardi and Giambattista Tiepolo. This unique museum explores textiles and costumes of the past, and has an entire section devoted to the history of perfume making! One of the oldest palazzos on the Grand Canal, here you can view the collection of Giorgio Franchetti featuring many bronzes and sculptures, along with Venetian and Flemish paintings. It's somewhat disappointing—and misleading, in my opinion—that Venice does not have a great reputation when it comes to food as compared to other destinations in Italy. Many seem to believe or assume it is an overpriced "tourist trap" of a city, full of inferior restaurants serving sub-standard expensive food. It is true that in the most touristy areas of Venice (specifically the San Marco Sestiere, and the areas around the Rialto bridge and Santa Lucia train station), you will find sub-par establishments overcharging you to eat frozen pizza and watery pasta. But a savvy tourist will get away from the crowds and in doing so find wonderful establishments serving authentic, well-made Venetian cuisine. Venetian food is quite unique, drawing upon spices and flavors of the Middle East and combining them with the region's bounty of seafood. There are also hearty meat dishes to try, like Venetian Liver and Onions, or Beef Carpaccio—invented here at the famous Harry's Bar. Sardines in sour sauce and salt cod Venetian style, served with polenta. If you're planning a trip, you might also wish to check out my Venice restaurant reviews at my food blog, South Jersey Foodie. You'll find lots of detailed information on what I enjoyed ordering - and eating - throughout the city as well as some of the other islands around the lagoon including Burano, Murano and Torcello. Venice: Beautiful city, beautiful food! Another special aspect of Venetian cuisine you should experience is cicchetti. Cicchetti is the Venetian equivalent of Spanish tapas, or small plates, enjoyed by locals in small bars and osterias typically in the late afternoon and early evening. You can even make an entire, fun evening meal out of traveling around to different Cicchetti bars, sampling rice balls, marinated vegetables, seafood bites and tiny sandwiches of house-cured meats - all washed down with delicious wine or Venetian "Spritz" cocktails. Although there is plenty to see right in the heart of Venice, the adventurous tourist may wish to travel a bit off the beaten track for a change of pace. There are many other islands in the lagoon worth visiting, from the glass-making mecca of Murano to Torcello, the island where settlement of the lagoon first began. Where to go to learn more about Venice, Italy and for planning a vacation trip there. Official website of the city of Venice, with tourism information and much more. Buy museum passes, tickets for the Secret Itineraries Tour, and much more through this website. 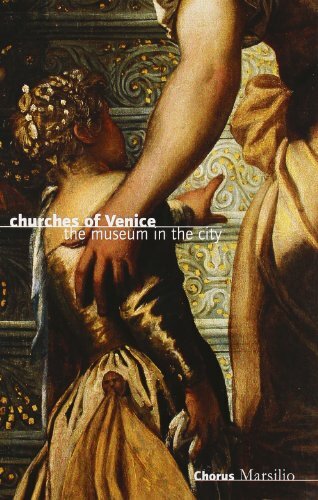 A wonderful resource for practical information on traveling to Venice. Learn how to get around, get discounts, free sights and attractions, and transportation details. Enjoy Venice - but watch out for the pigeons! I hope you enjoyed this travel guide. Feel free to leave any comments below!